Kitaysky, A.S. et al., 2006. A mechanistic link between chick diet and decline in seabirds?. Proceedings of the Royal Society B, 273, pp.445–450. Pravosudov, V.V., Kitaysky, A.S. & Omanska, A., 2006. The relationship between migratory behaviour memory and the hippocampus: an intraspecific comparison. Proceedings of the Royal Society B, 273, pp.2641–2649. Pravosudov, V.V. & Kitaysky, A.S., 2006. Effects of nutritional restrictions during post-hatching development on adrenocortical function in western scrub-jays (Aphelocoma californica). General and Comparative Endocrinology, 145, pp.25–31. Benoqitz-Fredericks, Z.M. & Kitaysky, A.S., 2005. Benefits and costs of rapid growth in common murre (Uria aalge) chicks. Journal of Avian Biology, 36, pp.287–294. Benowitz-Fredericks, Z.M., Kitaysky, A.S. & Wingfield, J.C., 2005. Steroids in allantoic waste: An integrated measure of steroids in ovo. Annals of the New York Academy of Science, 1046, pp.204–213. Kitaysky, A.S. et al., 2005. 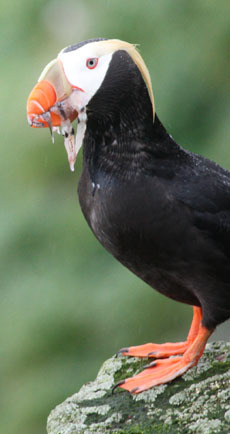 The adrenocortical response of tufted puffin chicks to nutritional deficits. Hormones and Behavior, 47, pp.606–619. Thompson, C.W. & Kitaysky, A.S., 2004. Polumorphic flight-feather molt sequence in tufted puffins-a rare phenomenon in birds. The Auk, 121, pp.35–45. Williams, T.D. et al., 2004. Individual variation in plasma estradiol-17B and androgen levels during egg formation in the Euopean starling Sturnis vulgaris: implications for regulation of yolk steriods. General and Comparative Endocrinology, pp.136346-352. Kitaysky, A.S., Springer, A.M. & Wingfield, J.C., 2003. When, where and why Steller Sea lions experience physiological stress-evidence from stress hormones and diet quality. Final Report to the Marine Mammal Research Consortium. Kitaysky, A.S. et al., 2003. Benefits and costs of increased corticosterone secretion in seabird chicks. Hormones and Behavior, 43, pp.140–149.